Let’s talk pizza today! I’ll start by letting you know that pizza USED to be my all-time favorite food! No, I’m not kidding. It’s really sad but if I had one last meal a deep dish, extra-cheese pizza would have been top on my list. Well, needless to say A LOT has changed in the last few years. Now, don’t get me wrong I still have the occasional craving for pizza but since learning all about the main ingredients in a regular pizza – I think I’ll pass. I mean it’s no wonder I was addicted to pizza – white flour, cheese, sugar in the tomato sauce and let’s not forget about the meat. Could you get any healthier – ha ha! 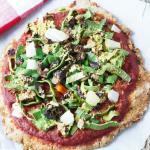 Now, let’s talk about my NEW favorite pizza – CAULIFLOWER CRUST PIZZA! I know what you must be thinking because it’s probably the same thing I thought when I first came across this recipe. 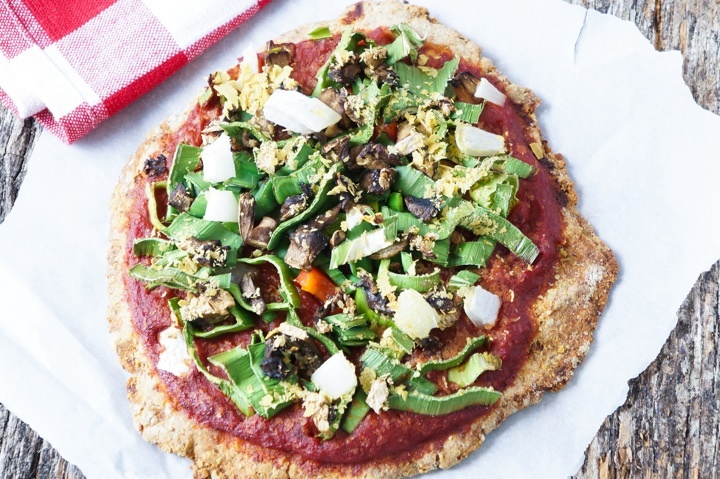 Really – pizza crust made from cauliflower??? I was envisioning something really mushy, more like mashed potatoes. Well, to my pleasant surprise not only does this crust have a delicious flavor but a great texture. I baked mine a little longer than recommended and the crust had a little crunch to it, which I just loved! I started seeing cauliflower crust pizza recipes everywhere, so I started I would give it a try. After much blog browsing, I decided to try the recipe found at www.simpleveganblog.com. I am soooo glad I did! I love the fact that Isoune’s recipe was so easy and there were not a lot of ingredients. I did add a little extra oregano (loved it!) and used 2 cups of chickpea flour. The combination was just perfect! A crispy crust with a touch of Italian flavor! By the way, have you wondered why there are so many cauliflower recipes floating around out there? Recipes like cauliflower fried rice or cauliflower mashed potatoes? Well, for starters cauliflower is actually a nutritional powerhouse, satisfies carb cravings and is very filling. Some of the health benefits include being a cancer fighter, offering anti-inflammatory benefits, helps to detoxify your body and boosts heart health. I used to overlook cauliflower but after discovering how many different ways you can prepare it, cauliflower is now a mainstay in my grocery cart! So, if you’re like me and dying for a pizza replacement this might just be the ticket. Honestly, I thought I was finished with pizza when I changed my diet. Thankfully, I have now found a delicious but healthier alternative and life as it once was is back to normal (well, almost)! PS…I froze some of the extra crusts and used them a week later and they were still just as delicious!!! Enjoy! Wow! 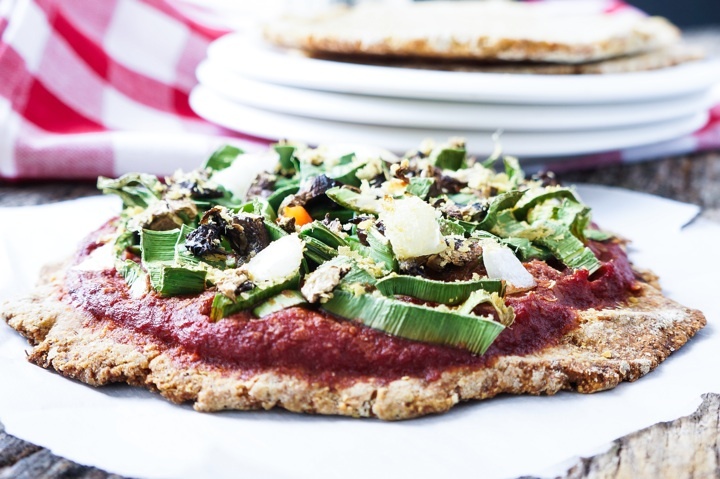 A delicious grain-free pizza crust that is loaded with flavor, nutrition and super-easy! Pre-heat oven to 390 degrees. 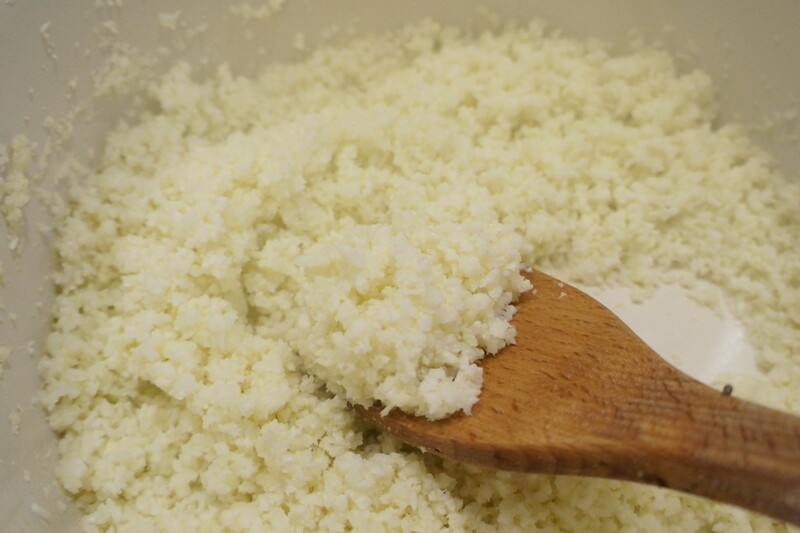 Cut off the florets of the cauliflower and place in a food processor and process until a rice like texture is formed. Place the cauliflower rice in a non-stick skillet (with no oil) and cook over medium heat, for about 5 minutes. Let cauliflower cool, then place it in a large napkin (cheesecloth would be best but I didn't have any) or a strainer and remove as much water as possible. Place the flax seeds and 9 tablespoons of water in a bowl and let sit for about 5 minutes, until an egg-like consistency is formed. In a big bowl add drained cauliflower rice, flax-seed eggs, rice flour, chickpea flour, salt, spices and herbs. Mix all ingredients with your hands. 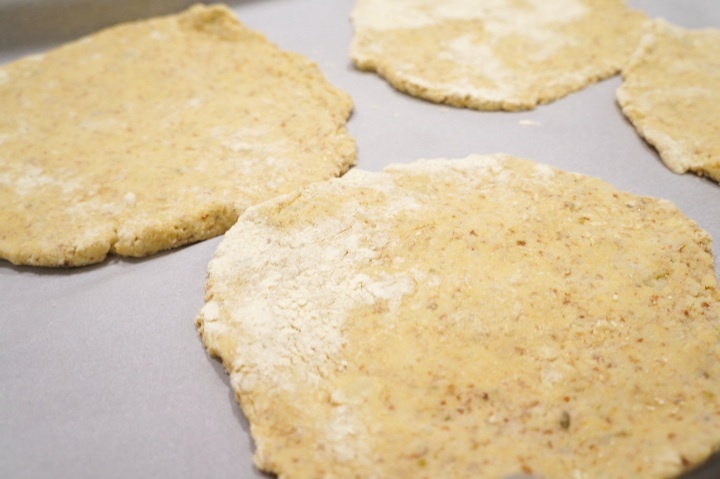 Knead the dough on a floured counter or board. If mixture is too wet add more flour. If too dry add some water. Using a rolling pin or your hands, roll the dough into whatever size crust you prefer. I made 4 six inch pizza crusts. Place the crust onto a parchment lined baking sheet and brush with olive oil. Bake for about 15 minutes or until golden brown. Add toppings of your choice and bake for another 15 minutes or so. Enjoy! Peanut Butter Chocolate Dream Pie! Southern Vegan Kitchen Copyright © 2019.
southernvegankitchen.com is a participant in the Amazon Services LLC Associates Program, an affiliate advertising program designed to provide a means for us to earn fees by linking to Amazon.com and affiliated sites.